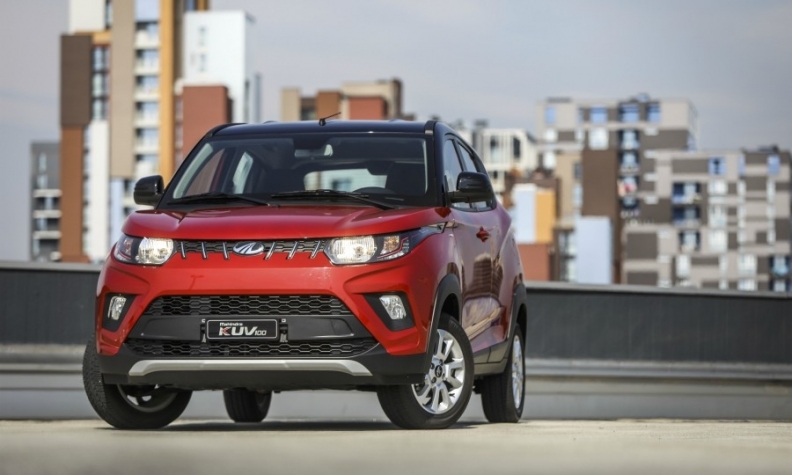 Mahindra is launching its KUV 100 mini-SUV (shown) in selected European markets. The model starts at 10,480 euros in Italy. Anand Mahindra is the man behind his namesake company’s plan to expand beyond affordable mass-market cars mainly for India into luxury vehicles that will be sold worldwide by a new company with Italian heritage, Automobili Pininfarina. This will start with a full-electric hypercar that costs almost 2 million euros. Mahindra shared his plans and his views on how the industry is evolving with Automotive News Europe Associate Publisher and Editor Luca Ciferri on the sidelines of a Formula E race in Rome, Italy. Why did Mahindra, a mass-market automaker, decide to jump into ultraluxury cars instead of premium models, which would have been a more logical first step? When you aim for the pinnacle of the car market, if you have middle-of-the-road goals, you have lost the ladder already. You have to create an aspiration that's unique. Why would anyone pay almost 2 million euros for a car? Because it's unique, pioneering and unparalleled. It's unparalleled in beauty and in performance. You have to shoot for that. Mahindra will use Pininfarina as a brand and as a designer to deliver unparalleled beauty. Where will you get the unparalleled technology needed to achieve the Automobili Pininfarina PF0 hypercar's performance? We are one of the pioneers in Formula E [the full-electric racing series]. When you go from race to road, Formula E is far more effective than Formula One. You rarely see Formula One technology on the road. Formula E will provide race-to-road know-how. We will also have collaboration with other technology providers who are very innovative. MAIN CHALLENGE: Leverage Pininfarina's history and design expertise to enter the luxury car business. What is the business rationale to expand Mahindra into ultraluxury cars? My personal vision is that the automobile industry will divide into three areas of motivation for buying. The first one comprises cars sold for commuting. Those will be functional and brand might play a very minimal role. Many will be electric vehicles. There’s no reason why a technology company can’t come and compete with you there. We already play in this area, we are pioneers in electric vehicles in India, where we have already provided half of the 10,000 electric vehicles tendered by the Indian government. We are also partnering with Uber, for example, in new experiments for providing our fleets. And fleets and ride-sharing companies will switch to electric as soon as they can. What is the second motivating factor? The segment where people buy cars for recreational use, for weekend driving, for going to the countryside. We are participating here with the Mahindra brand. We also just launched a new brand in North America called Roxor, which offers off-road vehicles and it's virtually sold out its first year of production. This is where people buy cars because they are objects of desire. They buy them because of their passion for performance and beauty. That's the area where Mahindra doesn't have that cachet. Automobili Pininfarina allows Mahindra to participate in all three of what I personally believe are going to be the main segments of the automotive world. What will come after you debut the PF0 hypercar? The PF0 is a small-volume, high-priced car that is our way of introducing the Automobili Pininfarina brand to the world. It will take technology and design to extremes. Then we will have to go down [market] a little, but not too much, to maintain the four elements that we consider crucial: technology, luxury, purity in design and sustainability – because Automobili Pininfarina will be electric-only. You bought a controlling stake in Pininfarina in 2015 – did you envisage using the name for ultraluxury cars? Clearly, we did, because being able to access the [Pininfarina] brand we could fulfill our vision of participating at the very pinnacle of automotive design and manufacturing. We can't stretch the Mahindra brand too far up, nor can you stretch the Pininfarina brand too far down. My wife, who is a publisher of a luxury women's magazine, always reminds me that luxury is the meeting point of heritage and craftsmanship. Pininfarina has both, so it's a base we can build on. What are the differences that separate Pininfarina SpA and Automobili Pininfarina? Pininfarina SpA is a design and engineering service provider not only for automobiles but for the transportation sector as a whole, plus product design and architecture. Automobili Pininfarina is a new company that will use the Pininfarina brand to produce a hyper electric car. Automobili Pininfarina is a 100 percent subsidiary of Mahindra & Mahindra, while Pininfarina is jointly controlled by Mahindra & Mahindra and its Tech Mahindra engineering subsidiary. People will call the PF0 hypercar a Pininfarina model. Will that jeopardize Pininfarina SpA’s role as a service provider to other automakers? Pininfarina SpA is an independent, iconic company and we are committed to its independence. We have helped to turn it around and it showed very robust financial results last year. Its business is growing. So, Mahindra's initial investment has not deterred customers so far. We also believe that when you create a separate company where the story is beautiful, you avoid any jeopardizing risk. My undergraduate degree at Harvard was in filmmaking, not in engineering. So, I tell stories, and to me, brands are built by stories. As a filmmaker, could you elaborate on your vision for Automobili Pininfarina?